Originally posted: September 27, 2017 . Last modified: January 27, 2019 . 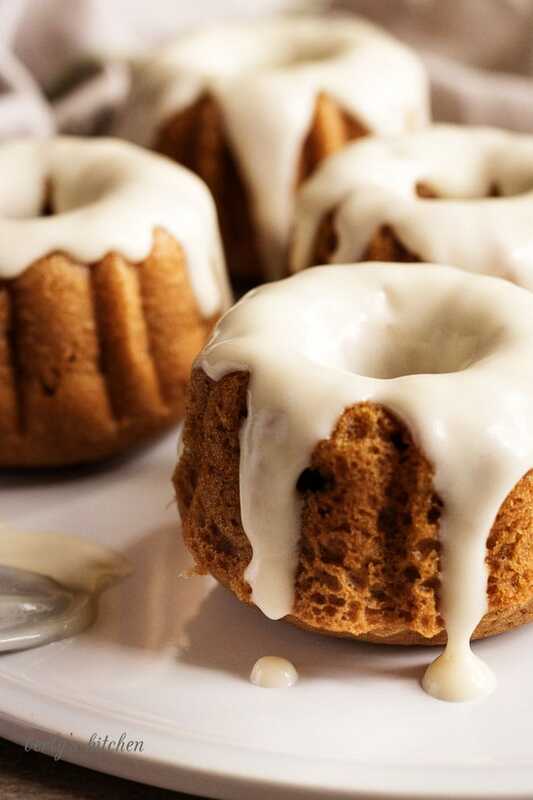 Celebrate Fall with our mini pumpkin spice bundt cakes. They’re sized to share, filled with seasonal spices, and topped with maple frosting! In case you were wondering, yes, it’s definitely pumpkin season. With Fall slowly making its way through the Northern states, we can finally declare it the season of warm spices and cold temperatures. In our house, we celebrate the season by baking and filling the house with all those great seasonal aromas. 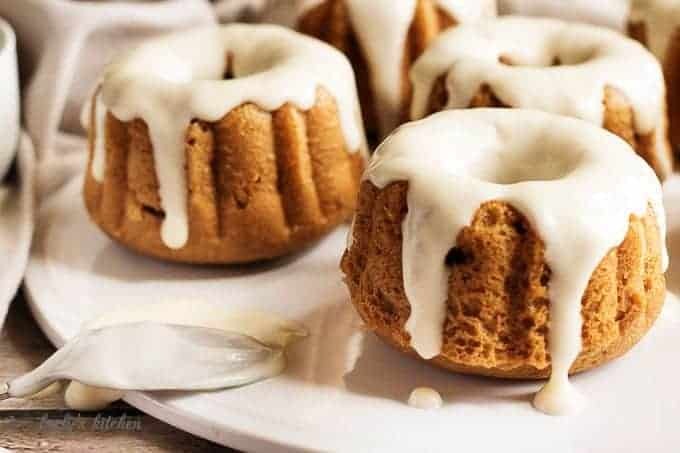 Today, we are sharing our mini pumpkin spice bundt cakes. Not only does this dessert scream “loaded with pumpkin flavor,” but it’s also topped with maple cream cheese frosting. It doesn’t get much better than this. Once you put these little treats into your oven, Fall’s perfume permeates throughout your home. Hints of cinnamon, nutmeg, and clove float delicately from your kitchen, and there’s no arguing that the fragrance is divine! 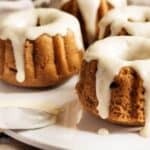 As is the case with most of our recipes, these bundt cakes are easy to prepare and delicious to eat. Kimberly and I decided to use a spice cake mix as the base of the cakes. From there, all we had to do was add a little canned pumpkin to flavor the batter. Instead of using a buttercream frosting, we made a simple cream cheese glaze. While I know there’s a difference between frosting and glaze; our topping is somewhere in between. The maple syrup and milk thinned it enough to be poured. However, the cream cheese and powdered sugar helped it maintain enough “thickness,” that it still coated each of the bundt cakes. 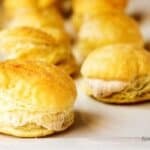 So, you don’t have to worry about the baked goods soaking up all the moisture and becoming soggy. 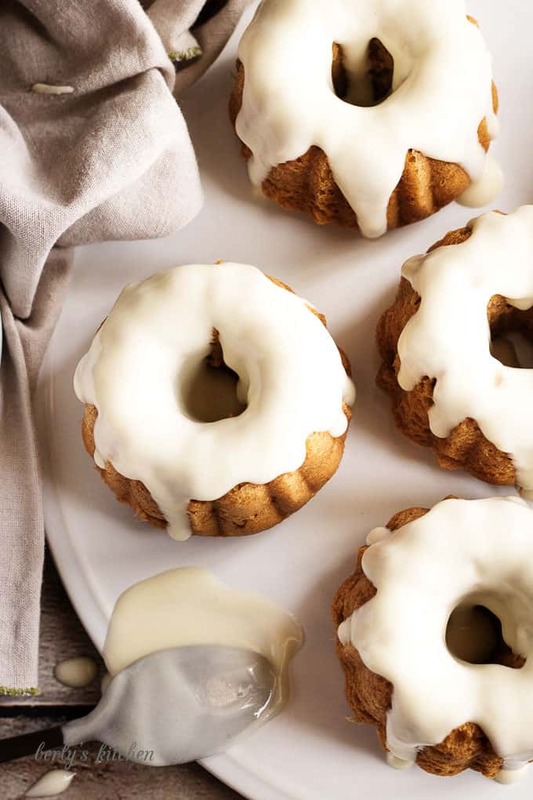 There aren’t any tips or tricks needed for these bundt cakes. The dish is pretty straightforward. All you need is the patience to let them cool before you add the frosting or glaze. In closing, I hope you decide to make this offering and share it with someone special. I wish you all a long life, love everlasting, and a belly full of pumpkin sweets! If you like this recipe, please leave us a comment and rate the recipe card. You can also find us on Facebook, Pinterest, Twitter and Instagram searching for Berly’s Kitchen! 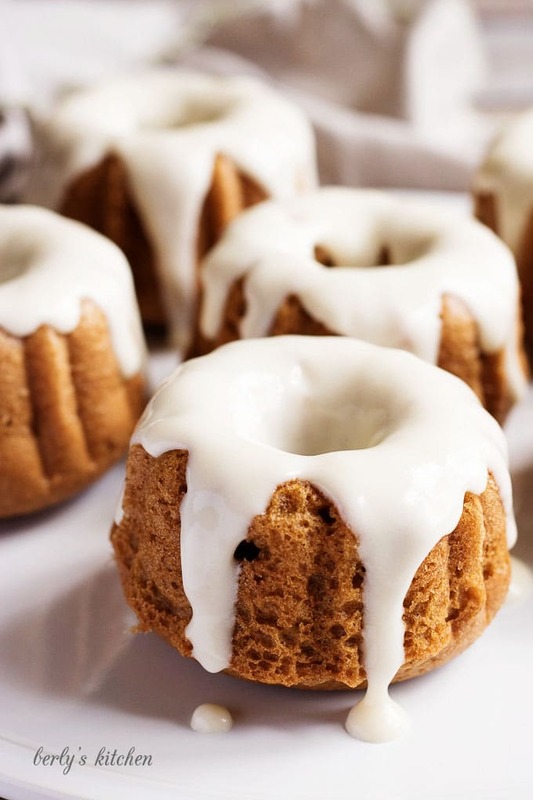 Celebrate Fall with our mini pumpkin spice bundt cakes. They're sized to share, filled with seasonal spices, and topped with maple frosting! First, remove the cream cheese from your fridge and set it out to soften. After that, preheat your oven to 325 degrees F.
Next, with a hand mixer in a large bowl, or using a stand mixer, combine the cake mix, water, eggs, oil, and pumpkin. Blend the ingredients until the batter is smooth. Then, spray a mini bundt cake pan with non-stick spray, and fill each mold with cake batter until they are all half-full. Last, bake the bundt cakes for 15 to 20 minutes or until they are done. Remove them from the oven and place them on a cooling while you make the frosting. 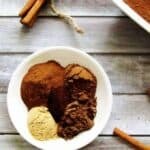 First, combine all the frosting ingredients in a stand mixer or large bowl using a hand mixer, and blend them until the frosting is creamy and smooth. Afterward, use a tablespoon to drizzle the frosting or each bundt cake once they cooled. For best results, serve them immediately. The calories listed are an approximation based on the ingredients, and each bundt cake represents two servings. Actual calories may vary. This dessert is meant to be shared. Bundt cakes can be stored in a sealed container in your fridge for up to two days. These are so sweet! 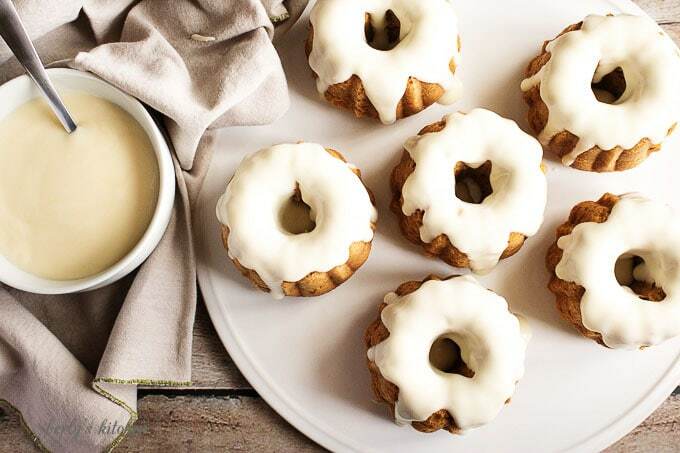 Like most, I am pumpkin obsessed right now…love the addition of the maple glaze! And I think I need this bundt pan! These look so yummy!!!! I love cream cheese! This icing glaze looks fantastic. Those look cute and tasty! My husband likes pumpkin flavored stuff, so he would probably love these! 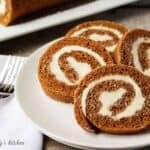 This recipe looks delicious and simple! Can’t wait to try it out! I haven’t tried cream cheese frosting but willing to try it out.